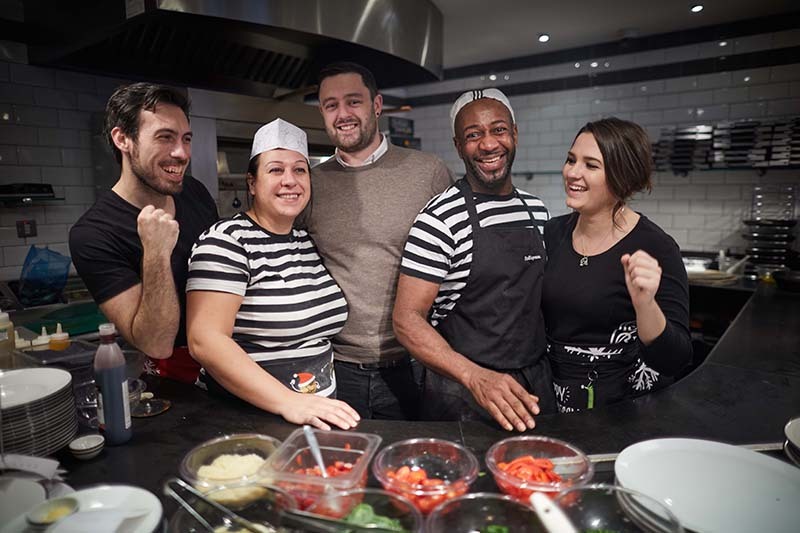 PizzaExpress is celebrating the launch of its exciting new look restaurant in Prestwich. This family friendly restaurant has been totally transformed with a fresh new décor and contemporary fixtures and fittings. New artwork in the restaurant at 130 Bury New Road has been inspired by PizzaExpress’s prestigious history over last 50 years, with imagery reflecting jazz, art, founder Peter Boizot, Soho London and authentic Italian ingredients. All new decorations throughout, along with new feature tiling, pendant lighting, settles and chairs, enhance the customer dining experience at the restaurant, which has a vibrant and welcoming atmosphere. The transformation has come just in time for the new Christmas menu which includes a Porchetta Natale Romana, with pulled seasoned hog roast with a herb stuffing, pancetta, mozzarella and rosemary. There’s also a Cauliflower Cheese Romana, featuring cauliflower florets, Pecorino cheese and garlic oil on a creamy cheese and mustard sauce. And among the seasonal desserts are Snowball Dough Balls, sprinkled with icing sugar and cinnamon, and Jaffa Profiteroles, filled with a zingy chocolate cream and orange centre. For younger pizza-lovers, the Piccolo menu is full of tasty choices including ‘Create Your Own’ pizza, and starts at just £3.95. And for budding chefs looking to celebrate a birthday, a Pizza Making Party will see them transformed into pizzaiolos so they can stretch, toss and top their own pizza and play party games before sitting down to enjoy their culinary creations. For more details visit www.pizzaexpress.com or to download a voucher for a Main Meal and Drink for just £10, click here.